Here’s an updated “headshot ” of Tree. I’m very excited with how her face looks against the blue background of the moon. (I think that’s what that is anyway. LOL) Could be the blue eyes! I feel like she has a look of calm about her and I like that. I never know how a face is going to turn out…I just sort of build it as it comes to me. 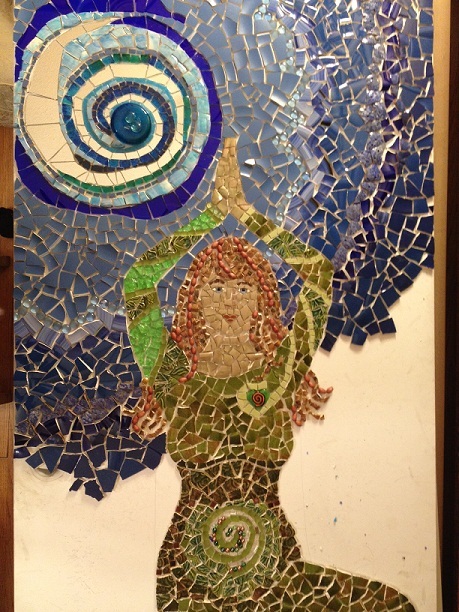 The true test will be when I grout her, as that is when she effectively pulls together and reveals her finalized look! 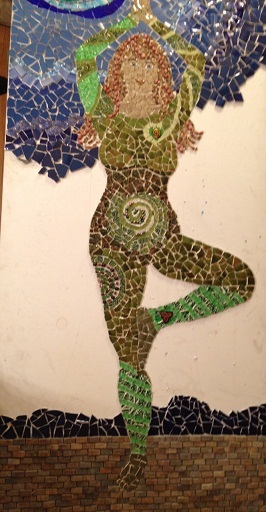 Here’s an updated full body shot that is a bit blurry–I was standing on a step stool above the table trying to get a shot that caught the entire piece. Unfortunately, the camera was nearly above my head–hence a bit of movement. This one is not the entire piece, but at least it isn’t as blurry! Okay, one more–sort of a mid body shot. So, that’s my update for this week. I plan to work feverishly on this piece this weekend with the idea of getting it done. Wish me luck! 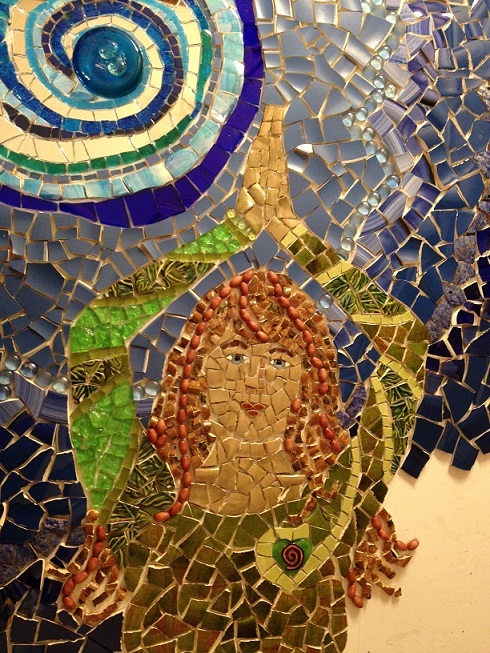 I’m also going to go to Mosaic on a Stick tonight to spend some quality time with the artists there…and I have two pieces that I will bringing home from the Goddess Show–one that you saw a process picture of and the other that you haven’t seen at all. 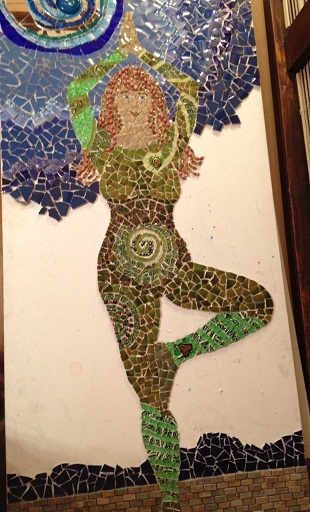 This entry was posted in Work in Progress and tagged tree, yoga. Bookmark the permalink.